Price: $13985 - Last Big Block! 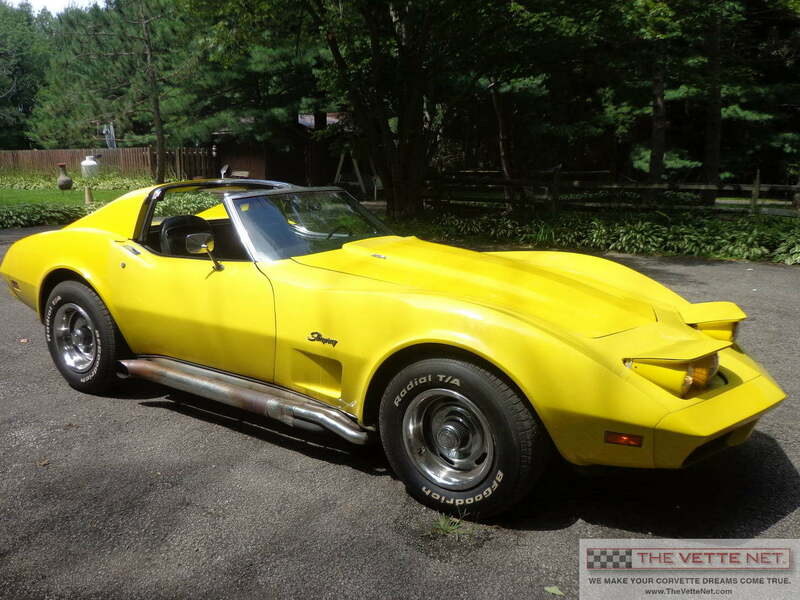 Welcome to THE VETTE NET a very proficient and knowledgeable online Corvette brokerage company. Since 1998, we have provided our professional broker services to the worldwide Corvette community assisting both buyers and sellers with their transactions. We look forward to adding you to our long list of happy clients. The 1974 model year was quite a milestone due to a few unique features like the last of the Big Blocks, the last of the "points ignition" and no catalytic convertors. The body is also unique as the transition from the Chrome bumpers ended featuring both rear and front poly-urethane bumpers. The rear bumper could not be manufactured reliably in one piece this year. The solution was to manufacture it in two pieces and put them together, this resulted in a seam down the middle of all the '74 models. Our offer today is a fine example of Yellow Big Block Coupe featuring the 454 engine (7.4L) rated at 270 HP... a very conservative number. It is mated with the Automatic transmission and features lots of options like Power Steering, Power Brakes, Air conditioning, 3.36 rear axle. It is a perfect choice for a driver as it is complete and in great shape. Paint appears to be original lacquer and it is still quite presentable with no cracks or excessive aging. Interior is the original standard Black with all the instruments and gauges in working order. An aftermarket radio was installed, but the original one comes with the car. Lots of work was recently done to the car: a new gas tank, carburetor, aluminum radiator, water pump, electric fans, new pointless distributor, spark plugs and wires . It also has new Rally wheels with centercaps and rings, and new 237/70/15 BF Goodrich Radial T/A tires with less than 50 miles. The AC system is complete, but now disconnected. It is likely going to be functional once reconnected. Undercarriage is very nice and detailed as seen in the pics. It runs and drives as it should and is ready for a new home. Located in OHIO, we will assist with delivery nationwide and all over the world. Motivated seller, bring offers!